A researched study on two of art's most fundamental themes, Colour and Light bridges the gap between abstract theory and practical knowledge. Beginning with a survey of under appreciated masters who perfected the use of colour and light, the book examines how light reveals form, the properties of colour and pigments, and the wide variety of atmospheric effects. Gurney cuts through the confusing and contradictory dogma about colour, testing it in the light of science and observation. A glossary, pigment index, and bibliography complete what will ultimately become an indispensable tool for any artist. This book is the second in a series based on his blog, gurneyjourney.com. His first in the series, Imaginative Realism, was widely acclaimed in the fantastical art world, and was ranked no.1 bestseller on the Amazon list for art insturction. 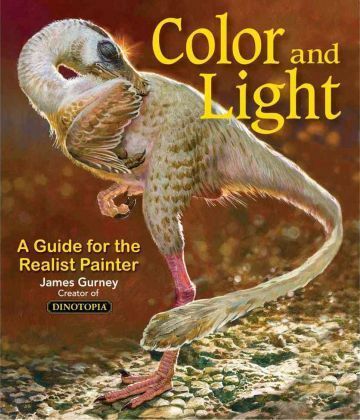 Author and illustrator James Gurney brings a perspective of realism and scientific accuracy to his work. His art currently appears in museum exhibitions around the world.